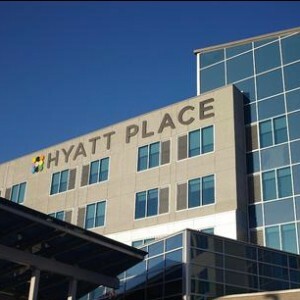 We recommend you take advantage of special arrangements made with the Hyatt Place Hotel. 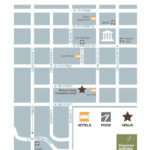 It is located in the heart of downtown and just 2 Blocks from the conference venue. To make a reservation please call 812-339-5950 and mention the conference or use the “Book It” button below. Room rates are $104 per night. Space is limited and this room discount offer ends October 12, 2018. 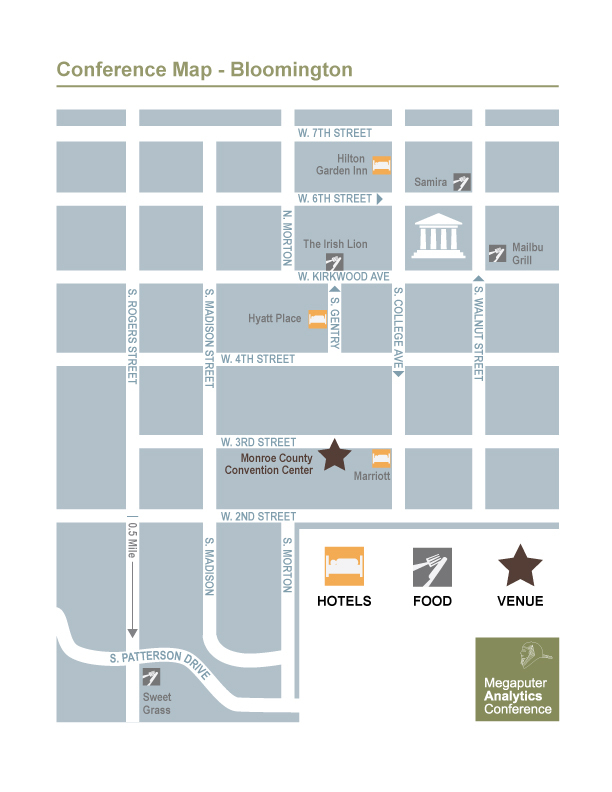 Just a few steps away from the Bloomington Convention Center, this is the closest hotel to the conference. To make a reservation please call 812-335-8000 and mention the conference (or use the “Book It!” button below). Room rates are $109 per night. 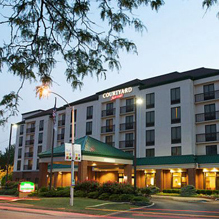 The Courtyard by Marriott is located in the heart of College Ave. near all the downtown Bloomington shops, restaurants and bars. Space is limited and this room discount offer ends October 4, 2018. *The discount period has passed, however if you call in and still mention the Megaputer conference rather than booking through the website, some participants are still getting the discounted rate! 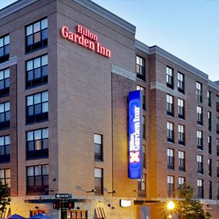 The downtown Hilton Garden Inn is another choice for Megaputer Analytics Conference attendees. It is located three short blocks of the Bloomington Convention Center. To make a reservation please call 812-331-1335 and reference discount code, MEGA or use the “Book It!” button below. Room rate is $119 per night. Space is limited, please reserve your room by October 9, 2018. Bloomington is 45 miles from the Indianapolis International Airport (IND). There are airport shuttles running every hour with drop locations at each of the recommended hotels. Shuttles typically run from 4:15AM until 10:40PM. For those of you that plan to arrive the night before the conference, Megaputer hopes to see you at the Meet & Greet, from 8:00 – 10:00 PM (Tuesday, November 6), Sweet Grass. This will be a casual affair for informal introductions to speakers and participants before the conference kicks off. To our guest speakers, partners, and company guests, Megaputer would like to treat each of you to dinner on Wednesday, November 7 at 6:30 PM at Malibu Grill and at Thursday, November 8 at 6:30 PM at The Irish Lion. Be sure to set a reminder to meet us there. (See map below).